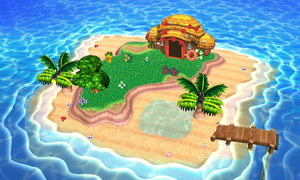 Tortimer Island as it appears in Smash. Tortimer Island (コトブキランド, Kotobuki Land) is a stage in Super Smash Bros. for Nintendo 3DS and Super Smash Bros. Ultimate. It was confirmed on March 7th, 2014. Its layout is assigned at random each time the stage is played on. In Tortimer Island, the island itself is the arena. It appears to be a single platform surrounded by water, although the layout of the stage is assigned at random every time it is used. It is possible for a pool of water to appear in the middle of the island. In for 3DS characters cannot swim in the water surrounding the island, and will simply fall through, but in Ultimate, the water is swimmable. The shop can be seen in the background and, as it appears with the available screenshots, Leila, Leilani, and Tortimer appear as background characters by the shop. 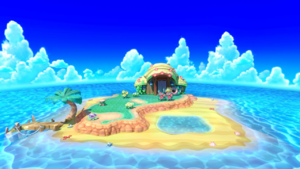 Kapp'n also appears as a background character on the dock, which is now located on the side of the island. He comes and goes from time to time, and whenever he does, he is on his motorboat, which can be used as a stationary, solid platform until he leaves. A shark can be seen in the water, which will attack fighters if they enter the water. The tops of the palm trees can be stood on by characters. Various fruits can grow on trees, and they can be knocked down to the ground, where players can eat them to restore their health or throw them. Occasionally, beehives will appear on the trees as well, which can also be knocked down and used as an item. In Super Smash Bros. for Nintendo 3DS, the Ω form is completely flat and the platform extends below the blast line. The shop is in the background, but Kapp'n, fruit-bearing trees, and sharks are absent. The stage layout also does not change into different variations. In Super Smash Bros. Ultimate, the Ω form and Battlefield form are similar to the Ω form in SSB4; however, the main platform does not extend below the blast line and is resized and reshaped to match Final Destination and Battlefield, respectively. The entire island is also suspended in the air. The three soft platforms of the Battlefield form are made of wood and are similar to the dock of the normal form. Four players on Tortimer Island as it originally appeared in Animal Crossing: New Leaf. Tortimer Island first appeared in Animal Crossing: New Leaf. To access the island, the player pays Kapp'n to drive him/her to the island with his motorboat. When the player lands on the island, the player starts inside the shop where rarer items can be purchased. Kapp'n's family, Grams, Leilani, and Leila, work in the shop. Tortimer himself greets the player on his/her first visit, but Kapp'n appears in his place afterwards. The shop itself is located on the north edge of the island and is connected to the dock. The rest of the island consists of trees that grow fruits that can not be found anywhere else, flowers, bushes, and a beach that goes all around the island. The island in New Leaf does not have a different layout each time a game is started, although the island may have a different appearance on another save file of the game. However, a pool of water will never appear on the ground of the island, as it can in Super Smash Bros. 4. In the Animal Crossing games, the player can go fishing with a fishing rod to catch various kinds fish during certain seasons of the year. Ever since Animal Crossing: Wild World sharks have been able to be caught. In this stage, sharks appear as a stage hazard to damage and knockback players. Tortimer Island is a universally banned stage in all rulesets. The stage layout is randomized every time it is selected, creating potential inconsistencies during gameplay. The size of the stage is also too large, which could allow characters with good mobility to stall and camp their opponents. Take a ride on Kapp'n's boat to reach this tropical island, home to fish, insects, and fruit you can't find anywhere else. Tortimer's tours are also available here. Eat the fruit on this stage to reduce your damage, but keep an eye out for the occasional bomb in the mix too! A tropical island where you'll find fish, insects and fruit that you can't get in your own town. To reach it, just take a ride on Kapp'n's boat. While you're fighting on this stage, make sure to eat some of the delicious fruits from the trees to heal yourself, but watch out - bombs sometimes get mixed in with the too! First image of the stage, posted in December 2013. An overview of the stage. One of the random stage variations. A variation of the stage's layout. Yoshi, Diddy Kong, and Pikachu near the shark. Another variation of the stage. Trophy of Tortimer Island from Super Smash Bros. for Nintendo 3DS. Robin and Link on the stage. A shrunken Bayonetta jumping away from Villager's incoming grab. Duck Hunt crouching next to Falco. Isabelle using her Fishing Rod near Goldeen. Villager taking out King K. Rool's pocketed crown, while K. Rool searches for it. Mega Man using Leaf Shield near a charging Ivysaur. Mr. Game & Watch using Judge 1 near Duck Hunt. Pac-Man dodging Mr. Game & Watch's Chef. Peach successfully countering Sheik with Toad. Pikachu dashing towards a shrunken Mario. Link, Pikachu, Bowser, and Inkling getting attacked by Rathalos. Ryu failing to perform a Hadoken, with Pichu laughing. Sheik performing Bouncing Fish near a Goldeen. Toon Link performing his up taunt. Wario using Chomp near a shark. Yoshi using his forward aerial. Zelda using her neutral aerial. Zelda crouching near a sleeping Pichu. Sheik charging up her Needle Storm. In All-Star Mode in Super Smash Bros. for Nintendo 3DS, fruits do not grow on the stage. This page was last edited on April 17, 2019, at 02:26.